I'm very interested in seeing it, especially now. I've long thiought they should make a movie about this subject, and it looks to be a good one. Regardless of any personal issues the man has, Tom Cruise is someone I very much admire as an actor. Glad to hear this is a quality film, I hope it does well for him and Singer. 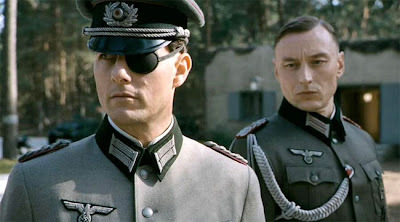 I was surprised to find out that this was filmed for TV in 1990 with the late, great, Brad Davis (Midnight Express) in the role of Stauffenberg, the telefilm neing called The Plot to Kill Hitler. I agree. I try very hard not to let personal infringe on professional when it comes to movies, or else I'd miss a lot of great stuff from Charlton Heston, Elia Kazan, Jon Voight, John Wayne, etc. I've long been a defender of Tom Cruise as an actor, and I can say that the general public had been waiting for his fall for a long time prior to his leap off the edge that made it difficult to defend him or even look at him without snickering. He's always been a movie star over an actor. He can only play The Tom Cruise Persona, but I can say through the early-'90s when he seemed intent on proving himself as an actor he learned to do amazing and complex things in and around that persona, twisting it around and even using it against itself. So, I'm intrigued to read this get such a convincing good review here. I have to say, if he's not terrible in this, then he should sue whoever cut the trailer, because it seems intent on making him look like he just stepped off the set of Losin' It into a Nazi costume and started trying to act. Regarding Cruise, the best thing about the film is how effectively he works in an ensemble with some world class stage actors. He manages to hold his own while restraining himself from trying to eclipse them. The film won't win any Oscars, but it is a nice little suspense movie.